The port of Amsterdam has many beautiful aspects. Cruise is one of them. For the inhabitants of the city of Amsterdam, the cruise sector is the most visible part of the port. The city is a beloved tourist destination all year round, for new and old visitors alike. With its vast cultural inheritance, it is also a popular destination for cruise liners. Ocean cruise vessels from all over the world moor at the Passenger Terminal Amsterdam (PTA). For the handling of river cruise vessels Port of Amsterdam provides several docks near the PTA. Both terminal and the docks are located in the heart of the city centre, next to the central station. Amsterdam Schiphol Airport is at arm’s length, only 15 minutes away. The cruise facilities and the handling of luggage and passengers at the port of Amsterdam are of very high quality, keeping it in the top 5 of North-West European cruise destinations. The amount of cruise liners that call at the port of Amsterdam increases annually. Port of Amsterdam continuously works on its service when accommodating the growing cruise sector. And it does so in the most sustainable way possible. One example is the provision of shore power for the river cruise industry. Another is the participation in the ‘Green Cruise Port’ initiative which has the objective to make the ocean cruise industry more sustainable. 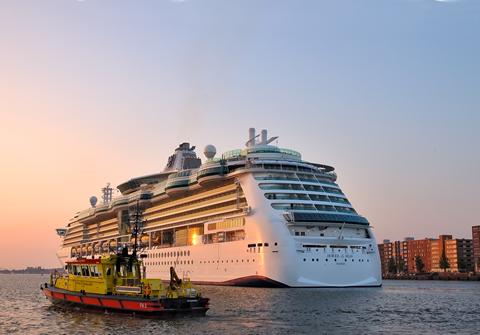 The use of LNG as a fuel and recycling on board, such as converting food residues into feed stock and using waste water for the flushing of toilets, are stimulated through the ‘Green Cruise’ coalition. Mövenpick Hotel Amsterdam City Centre prides itself on being the best accessible hotel in the city centre of Amsterdam.